One of the world’s most famed primatologists, Jane Goodall, said Harambe, the gorilla who was shot and killed after a child fell into the animal exhibit, was protecting the child. Goodall wrote an email to the Cincinnati Zoo director Thane Maynard on May 31. She said she believed the gorilla may have been protecting the boy who fell into the animal’s exhibit. “I tried to see exactly what was happening—it looked as though the gorilla was putting an arm round the child—like the female who rescued and returned the child from the Chicago exhibit,” said Goodall. She compared the situation to a similar incident in 1996, when a boy fell into the gorilla exhibit at the Brookfield Zoo in Illinois. In that case the female gorilla carried the child to safety after his fall. 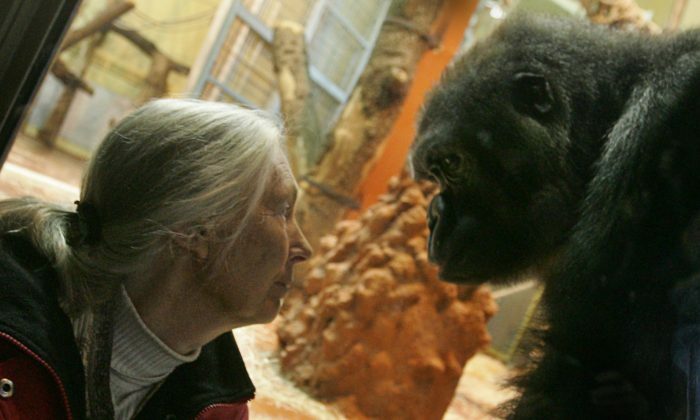 The scientist and animal rights activist, who spent decades researching and transforming the way humans understand chimpanzees and other animals, sent her sympathies to Maynard in the email over the death of the 17-year-old gorilla. “I feel sorry for you, having to try to defend something you may well disapprove of,” said Goodall in the email to the director. Harambe was shot after he dragged the 3-year-old boy who fell into his pit on May 28. Video shows the gorilla tugging the child across the enclosure, but other parts of the video appear to show the animal guarding the boy. Goodall then asked Maynard how the other two female gorillas that were living with Harambe reacted to the death. “How did the others react? Are they allowed to see, and express grief, which seems to be so important?” she wrote. Another primate expert weighed in on the shooting of Harambe. “Seeing more of the videos, I got the impression that Harambe was mostly protective. He showed a combination of protection and confusion,” said Director of the Yerkes National Primate Research Living Links Center at Emory University, Frans de Waal. “He stood over the child, held him up, moved/dragged him through the water (at least once very roughly), stood over him again. Much of his reaction may have been triggered by public noise and yelling,” he wrote on Facebook.